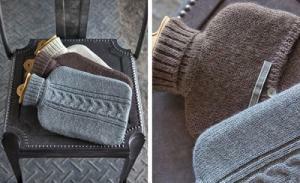 A natural rubber hot water bottle insulated by 100% Baby Alpaca, raised and woven in the US. The luxurious woven Hot Water Bottle Covers are made from 100% baby alpaca. They are hypoallergenic, extremely soft and warm yet light weight. This soft and soothing hot water bottle has quickly become the hottest new twist on an “old” classic — everyone will want one! You can easily take out the bottle and fill it up with hot water. Bottle included. Hand wash cold. When we met David and Alicia Adams, we knew there was something special about them and what they were doing. They raise and manage their own herd of over 200 suri alpacas at their family farm in New York’s Hudson Valley. The farm is comprised of 80 acres of rolling meadows, dense woods and beautiful ponds. Local, sustainable, pure. Alpaca, one of the world’s most luxurious fabrics, is a jewel amid all the synthetic fibers and harsh materials found in our everyday lives. Softer than cashmere, and available in a wide array of natural colors, alpaca serves as a natural thermostat by using microscopic air pockets to trap body heat in cooler temperatures and to release heat in warmer weather. Cool in the summer & warm in the winter.